It's not the same as a clarifying shampoo, baby shampoo, or no-salt shampoo. Other Keratin treatments in the market, don't mention a dilating shampoo, one which purposefully contains an alkaline ph able to fluff and open the cuticles without damaging the hair. In this sense Soft-Liss has been the first and only keratin treatment to implement the use of a dilating shampoo or of a deep clean from natural bio-actives to open the cuticles without breaking or damaging them. 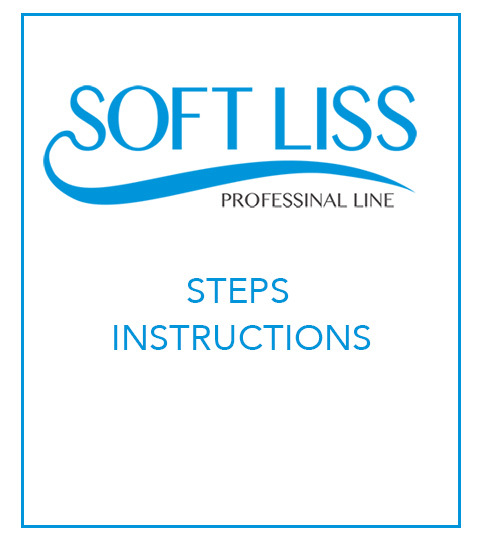 Wash the hair with Soft-Liss STEP1 Deep Wash Shampoo and warm water, softly massage the hair. This step will allow the hair cuticles to open and will prepare them to receive Soft-Liss STEP2 Intelligent Brush. Rinse well and repeat the process 3 to 4 times. Remove the moisture with the help of a dryer and when the hair is 80% dry apply Soft-Liss STEP2 Intelligent Brush. With its advanced formula, it inserts itself into the cortex of the hair to re-align the protein chains responsible for the external appearance of hair, without destroying them. Upon being cauterized the treatment will inject nutrients that will rebuild the hair fiber, allowing it to be shaped into a straight or curly appearance, according to the desire of the client. Brush the hair to your taste and comfort. Separate it into thin streaks. With the help of a brush proceed with application from streak to streak spreading from the roots then using a fine comb brush towards the bottom to avoid having the excess product saturate the hairfiber and make it heavy and dull. At the end of the application process comb for 5 min and then wait 15 min. If the hair is EXTREMELY CURLY, it is better to do a quick brushing (just brush or comb from the root to the tip) with a hair dryer and a brush with synthetic bristles, to help in the straightening process, also acceptable are ironing brushes. If the hair is NATURALLY WAVY, remove the moisture of the Keratin with the aid of a hair dryer and plastic comb with wide teeth by gently combing to untangle and activate the product. Start the cauterization process with an flat iron that has been plated in tourmaline, titanium, or ceramic of which the temperature is 392°F = 200°C for fine hair and 428°F = 220°C for thick or stubborn hair. Depending on the quality and power of your iron perform 6 or 7 repetitions, until a shiny quality is noticed. The result will depend in great part to a good cauterization process. Use a half-inch iron for shorter hair or for hair with tight roots for better results. It is recommended that you study techniques for ironing both vertically and horizontally. Once we have dilated and cauterized the nutrients it is necessary to seal the cuticles so that those nutrients may last in the hair longer. Other Keratin treatments with Formaldehyde or other chemicals DO NOT utilize this process, since the keratin is synthetic and the formol auto-seals in 4 days. That is why one has to take extreme measures: You can't wet your hair with anything; You can't let rain fall on it; You can't put it in a ponytail; You can't tuck it behind your ears; You can't tie your hair; You can't twirl your hair; You can't touch your hair frequently; You have to brush it if you feel it getting tangled. NONE OF THESE CONCERNS ARE NECESSARY WITH SOFT-LISS. Wait 60 min after the application and rinse with cold water. DO NOT exceed this time since the seal should be made before the hair contains impurities. With a towel, remove the remaining moisture. Apply Soft-Liss STEP3 Nurturing Mask . Untangle with your hands while massaging the hair. Allow the mask 15 minutes to act. Rinse again with cold water only and that's it, just do a quick blow-dry and flat iron. Now, enjoy hair that is more than straight or curly, but hydrated and reconstructed with life. The touch-up should be done completely (throughout all the hair). Please consider the following suggestions so that you and your clients may maintain not only the benefits of the treatment, but also to keep your hair HEALTHYAND FULL OF LIFE. Utilize the Soft-Liss No-Salt Shampoo and Conditioner since it contains no aggressive chemicals (DOES NOT CONTAIN sodium chloride), with nutritional properties and a neutral pH. When visiting the beach or pool, protect your hair with a protective cream depending on the alkalinity of the sea water or the chlorine in the pool. We recommend the Soft-Liss Shine Intensifier. The care and growth of your hair will indicate when to repeat the treatment even though Soft-Liss is formulated for a duration of 4 to 5 months with proper care.